Readers of yesterday’s blog (apologies for getting the date wrong) may recall the late entry of an accident that had occurred on the Whilton Flight behind us. 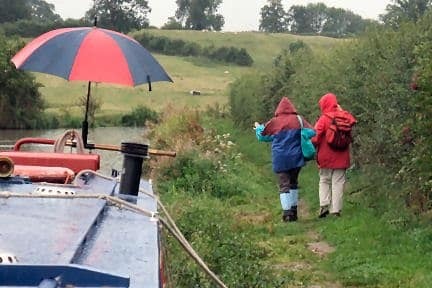 Early this morning the Towpath Telegraph reported that the boat had been lifted out of the lock overnight. 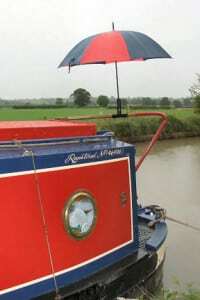 But the crew of Wandering Star (see Monday’s blog) had been witnesses, moored outside the lock waiting to go up, indeed Mrs Wandering Star made the emergency phone call to British Waterways. 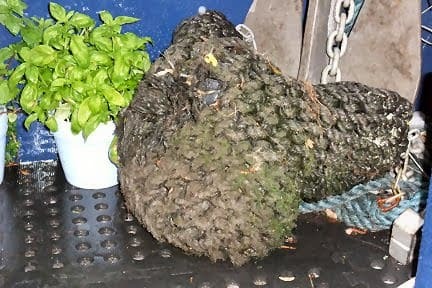 The hire boat had been the only boat in the lock, it had caught its stern on the back cill as the water was going down. The front of the boat dived and water began to fill the cabin. All three crew managed to escape, although with very wet legs. The boat slithered and tilted into a sideways angle. Efforts to refloat it were unsuccessful. 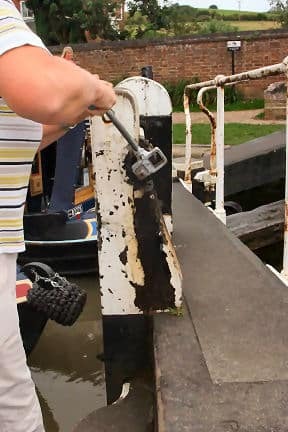 The British Waterways staff pumped out the boat, drained the lock and the pound below, managed to right it, refilled the lock and pound and then it was rope-hauled out of the lock. The lock itself was cleared by early evening – and the hire boat company in Leighton Buzzard is no doubt left with a headache. Mr Wandering Star showed photos recorded on his digital camera to those of us doing the Braunston Flight today. Cleddau’s watery meanderings have been tracked by many. Bedfordshire readers are only too aware that if the Bedford / Milton Keynes Waterway Trust ( www.b-mkwaterway.co.uk ) is successful in its aim to “close the gap” our boat trip to – and from – Bedford would have been a great deal shorter, and not involved river routes, drainage ditches or tidal terror. Seventeen days after leaving Bedford (with a couple of days thumb-twiddling and sight-seeing to take into account) we were still only about 75 minutes car journey from home. So up the towpath this morning came two dear friends, bearing gifts, fresh produce from their respective gardens. The Captain, ready to abandon a bit of rust-prevention work, cast off, floated towards the top lock – and we shared each of the six downhill locks with Wandering Star. 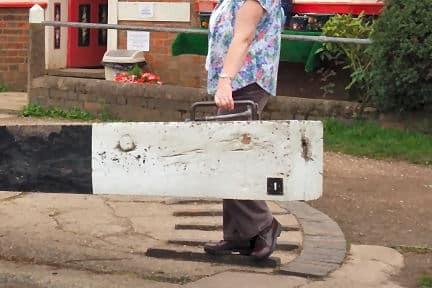 One friend, an experienced boater, soon proved herself by multi-tasking, making the first pot of tea and wielding a lock handle. The other, a novice at the start, by Bottom Lock had wound and pushed, lowered and closed. Thank you crew! 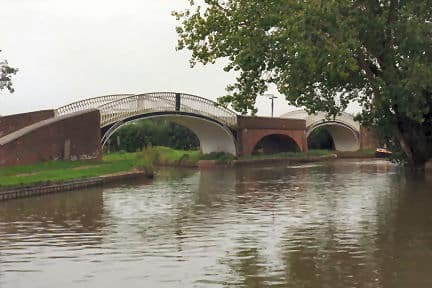 We glided past Braunston workshops, hire boat base under the marina bridge to fill with water, purchase gas and get rid of rubbish. Morning domestics completed we sallied on to fulfill many a boater’s dream – to moor right outside a pub for lunch. The Boat House is vast, especially for folk accustomed to a sixty by seven foot floating corridor. A route march to the bar, squint into the distance for toilet signs, spread out around the table… After days and weeks afloat the cogs clank as the brain readjusts to a former world! Lunch eaten (Two for the Price of One, to be recommended) we adjourned to the boat, drank coffee and moved a further mile, on past the twin bridges of Braunston Turn, before it was time for our crew’s towpath trek back to their car. We trundled on, past ridge and furrow fields, under small red brick bridges, as the rain established itself as both heavy and constant. 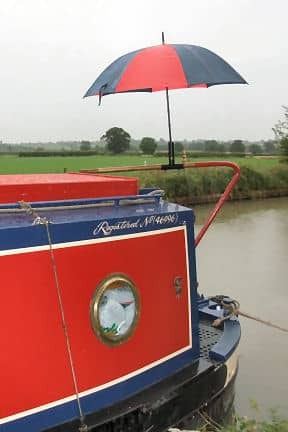 On the stern the helmsman praised the effectiveness of his umbrella coverage, self-congratulatory on selecting the red and blue version (“matching, see!”) rather than the brown and green one. A strategic mooring place was chosen, before the Hillmorton Three but far enough away from the Rugby railway junctions. 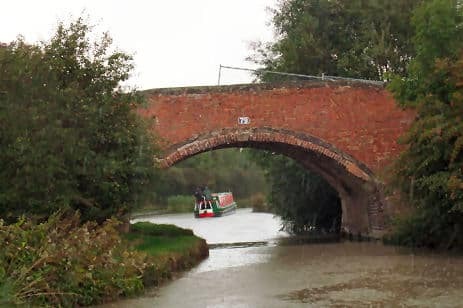 The bridges would typify this canal stretch: photo opportunity sought. First bridge too slow to get camera out; next bridge a modern installation; third bridge in grave danger of collapse; fourth, Bridge 79, not quite the pleasing picture planned! Bridge 80, warning signs too close, bridgehole narrowed, ominous cracks, parapet partially missing… who will fund repair or rebuilding of a farm bridge between pastures? News from the front deck: between Ely and Peterborough the mint and basil were entirely self-watering; currently similar conditions prevail. They suffered both from wind and wet rope abuse when on the Nene but both are looking well (and hopefully will not drown overnight). They have company now, the sad and much battered lower fender, these past two years an excellent buffer when exiting Lyme View Marina. Warning had been issued yesterday of its perilous state but by today a shackle had snapped and down it trailed on boat’s port side. Where else do you put such an object?